The 74F779 is a fully synchronous 8-stage Up/Down Counter with multiplexed 3-State I/O ports for bus-oriented applications. All control functions (hold, count up, count down, synchronous load) are controlled by two mode pine (S0, S1). The device also features carry look-ahead for easy cascading. All state changes are initiated by the rising edge of the Clock When CET is High the data outputs are held in their current state and TC is held High. The TC output is not recommended for use as a Clock or asynchronous reset due to the possibility of decoding spikes. This is one package pinout of 74F779,If you need more pinouts please download 74F779's pdf datasheet. 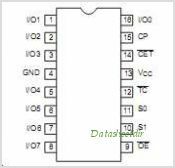 74F779 circuits will be updated soon..., now you can download the pdf datasheet to check the circuits!